Menulog delivers for Noodle Hut so you'll be able to track your courier on a map. Fried rice combined with a variety of crispy fresh vegetables. Traditional rice dish comprising of shrimp, chicken, roast pork, egg, bean shoots, onions, peas, carrots and shallots. 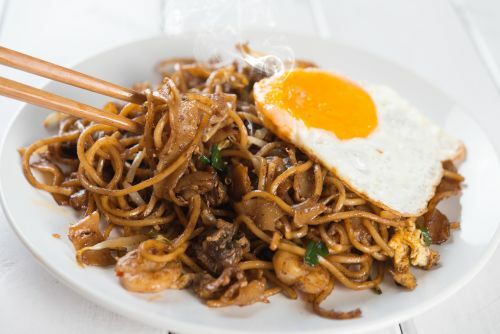 Thick egg noodles wok tossed with assorted vegetables in a satay sauce. Thick egg noodles wok tossed with assorted vegetables in a black bean sauce. Stir fried mixed vegetables and tofu with thin egg noodles in a soy sauce. Stir fried thin rice noodles with a light curry, shrimp, roast pork, bean shoots, onion, capsicum, carrots, eggs and shallots. An appetising dish of thick egg noodles, chicken and assorted vegetables in a tasty satay sauce. Chicken and seasonal vegetables with Hokkien noodles in a delicious teriyaki sauce. Udon noodles with chicken and vegetables in a Kikkoman sauce. Stir fried thin egg noodle with vegetables and chicken in a honey sauce. Stir fried thick rice noodles with roast pork, shrimp, bean shoots, onion, capsicum, carrots, egg and shallots in a dark soy and chilli sauce. Popular dish of beef in a black bean sauce combined with vegetables and thick egg noodles. Beef and vegetables with Hokkien noodles in a sweet Mongolian sauce. With chicken or beef, Hokkien noodles and seasonal vegetables. With thin rice noodles, seasonal vegetables and chicken or beef. Stir fried thin rice noodles with vegetables and chicken or beef in a pad Thai sauce. For the chilli addict. Thin egg noodles cooked with a combination of chicken, beef, roast pork and vegetables in a special chilli sauce. Combination of beef, pork, chicken, shrimp and vegetables in a hot and spicy sauce. Seasonal vegetables with thin egg noodles. Tantalise the taste buds with this dish of thick noodles with prawns, shrimp, squid, fish cake, seafood chucks and vegetables in a spicy chilli and curry sauce. A combination of chicken, beef, roast pork, shrimp and vegetables with thin egg noodles in clear broth. Delicious wontons with vegetabes and thin egg noodles in a clear broth. An assortment of vegetables, chicken and udon noodles in oyster and dark soy sauce. A rich coconut curry soup with chicken, fish cake, vegetables, tofu and thick egg noodles. Combination of selected seafood and vegetables in a spicy coconut curry sauce with thin rice noodles. Fresh steamed dim sims made on the premises. Deep fried wonton filled with savory meat filling. Chargrilled chicken pieces thread into the bamboo skewers. Served with special made peanut satay sauce. Pan fried pork dumpling with homemade dipping sauce.